I used to think of us, at this high point of summer, as people perched at the top of a roller coaster’s first thrilling hill, but today I see that that’s the wrong image entirely. It’s no roller coaster that we are on, lurching gear by gear to the top of its climb, then dropping so fast our eyes can’t focus. 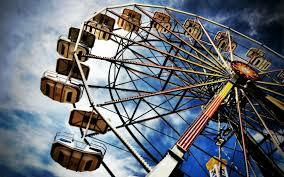 Rather it’s a Ferris wheel, that stately old machine into whose gently rocking seats we are strapped, then lifted slowly skyward, pausing in our ascent until the carts are all full, and those at the bottom are strapped in too. It doesn’t matter that those others are strangers to us. We are all on this ride together in the pale-yellow mornings and the violet-hued twilights; all of us together on this great wheel of Time. I hear tell that even as we here in these northern climes are kicking off our sheets and flipping our pillows to find the cool spot, it is winter in Argentina. In New Zealand. In Mozambique. I hear this but I can’t ever believe it, quite, not as a person who, in order to visualize ballet of our solar system’s, still needs to have one person stand in the center while nine other people orbit around him, turning in small circles themselves. This makes me sound like kind of a C-minus student of the sciences, I know, but I find I don’t mind that; I don’t see myself as more than a C-minus grasper of much in this world. At this time of year I’m more than happy to see myself as the soft animal that every human being is, not especially fleet of foot, undefended by natural armor, a small creature fated to return to the earth far sooner than many creatures with shells, or tusks, or fins. And what kinship I do feel with all creatures waking to these warm summer days! Take this array of ladybugs on my windowsill, who appear to be lazily arranging themselves into a necklace of red and black seed pearls, as if for their own idle amusement. Take this 18-month-old I saw at the electronics store, who decided to lie right down on the carpeting near the adapter/powercord/and earbuds wall. I saw him on his little back, dreamily waving his arms over his head and I wanted to lie right down right beside him and do the same. Take the lone turkey I saw last night, head-bobbing his way across a busy street as we humans in our passing cars braked quickly and stayed braked before passing him oh-so cautiously, and going on to warn oncoming cars of his presence. Take my neighbor’s cat who is the exact color of a butterscotch sundae and who comes each morning to tickle her tummy by strolling slow and easy through the flowerbed that lies between our yards. Slow and easy is how I want to walk now too, noting every least thing as we sail high over the fairgrounds. We’re at the top of the Ferris wheel still in this first full week of August, and the ride up has been plain lovely. We need only remember, as the days keep growing shorter, that the ride back down can be mighty lovely too. How wonderfully you capture the movement of the seasons. I’ve been feeling it too.